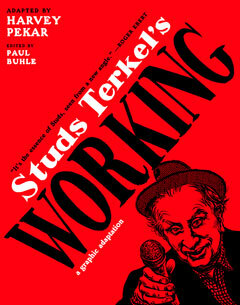 In the thirty-five years since Pulitzer Prize winner Studs Terkel’s Working first documented American workers’ hopes and dreams, that “deep penetration of American thought and feeling” (Los Angeles Times) has sold over a million copies, captivating readers with accounts of how their fellow citizens make a living. A masterpiece of words, Working is now adapted into comic-book form by Harvey Pekar, the blue-collar antihero of his American Book Award–winning comics series American Splendor. Brilliantly scripting and arranging Terkel’s interviews, Pekar collaborates with established comics veterans and some of the comic underground’s brightest new talent, selected by editor Paul Buhle. Readers will find a visual palette of influences from Mexican, African American, superhero, and feminist art, each piece an electric melding of artist and subject. This is a book that will both delight Terkel fans and introduce his work to a whole new audience—a fitting tribute to an American legend.